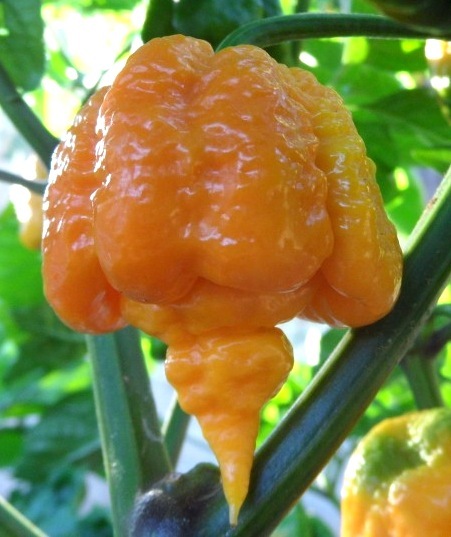 Posts Trinidad Scorpion or Trinidad 7 Pot? Both! I grow the hardest-to-find strains of rare hot chiles and any chile I grow for seed is isolated on one of 23 different properties in San Diego county. I have been growing the Trinidad superhots now for 3 years, trying to get the develop the best strains I can. 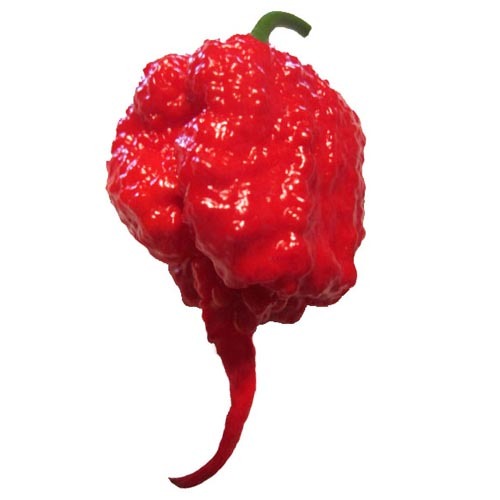 After all that growing, I have come to the conclusion that the Trinidad Scorpion and the Trinidad 7 Pot are the same chile–just variations of one another. And just like other chiles that have variations there will be differences in each variation–in in heat, flavor, color, tone, texture ,and size. We can isolate these different variations or strains over years to get what we want, whether it’s more Scorpion tails or more heat or darker color. Farmers have been doing this since the beginning of time. But until that happens Scorpion tails will appear on your 7 Pot plants and Scorpion plants will produce wrinkled lumpy pods that are 7 Pot. So why should any of us be surprised? Trinidad is not that big of an Island, slightly smaller than Delaware. It is impossible for a country so small to produce isolated pure strains consistently over thousands of years. 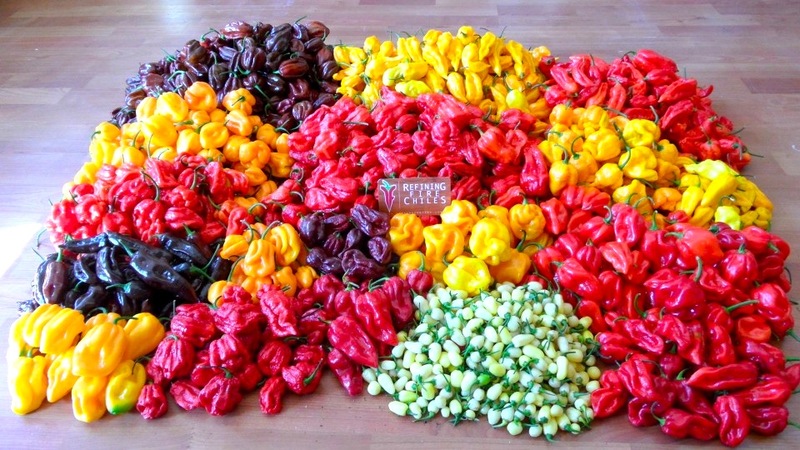 Lets look at some photos of chiles I produced and you will see the differences and similarities. 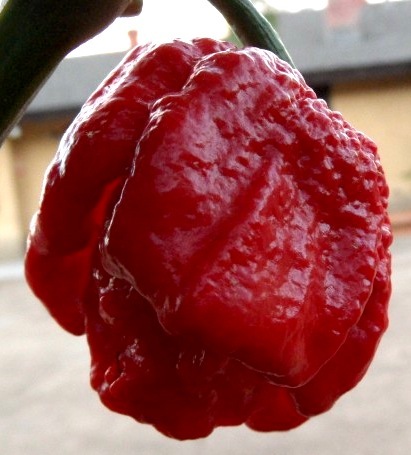 First, lets see the Trinidad Scorpion. Notice some pods have tails but some pods in left side of picture are wrinkly and have no tails. They have more of a 7 Pot look. 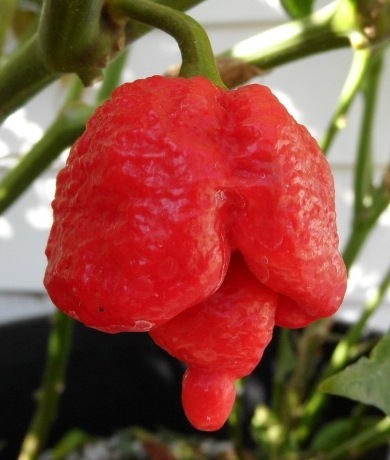 Trinidad Scorpions don’t all have tails. Most plants I have grown show about 30% forming tails on the pods. Now here are two pictures of Trinidad 7 Pot Jonah strain. Well, would you look at that! It resembles a Scorpion! In fact most SR Trinidad 7 Pots have a small tail and more consistency in pod shape and size than any Scorpion I have grown. Can you see the Scorpion resemblance? Now lets look at a picture of the Trinidad 7 Pot. This is the more consistent SR Strain from CARDI, the Caribbean Agriculture and Development Institute, located in St. Augustine, Trinidad. 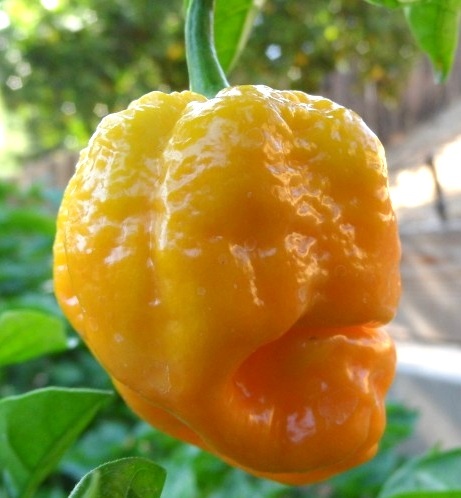 Now lets look at the Trinidad Yellow 7 Pot. Can you see the Scorpion elements in these? Now from the same plants I will show you a pod that looks more like a 7 Pot. Again we see both types in same group of plants. You can pick a pod off any plant and say “Scorpion” or “7 Pot”!! Now look at this photo and guess what it is. If you said Scorpion you are wrong. It is a Trinidad 7 Pot SR strain! Now lets look at some side-by-side comparisons. 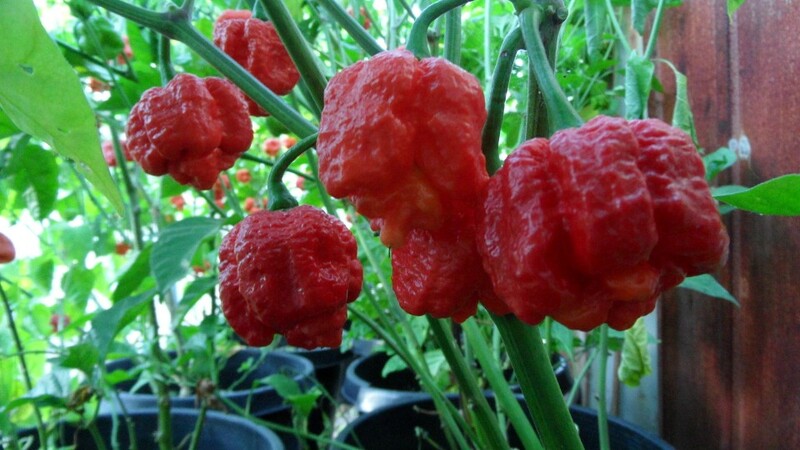 But first a picture of a group of Moruga Strain Trinidad Scorpions. So now we see a very consistent pod shape and size in this group, but not much Scorpion tail. However, some pods will grow a longer tail. And if you have been paying attention to all the previous photos this chile looks like the larger version of the Trinidad 7 Pot SR strain from CARDI. Now lets do some side by side comparisons. From left to right with Scorpion like tails on all of them we have the Trinidad Scorpion, Trinidad Douglah (Chocolate 7 Pot), Trinidad 7 Pot SR strain, Yellow 7 Pot, and Moruga Scorpion. I have not gotten a super long tail on my Douglah plants yet, but it will happen. Now in the second photo we will see a more 7 Pot look. 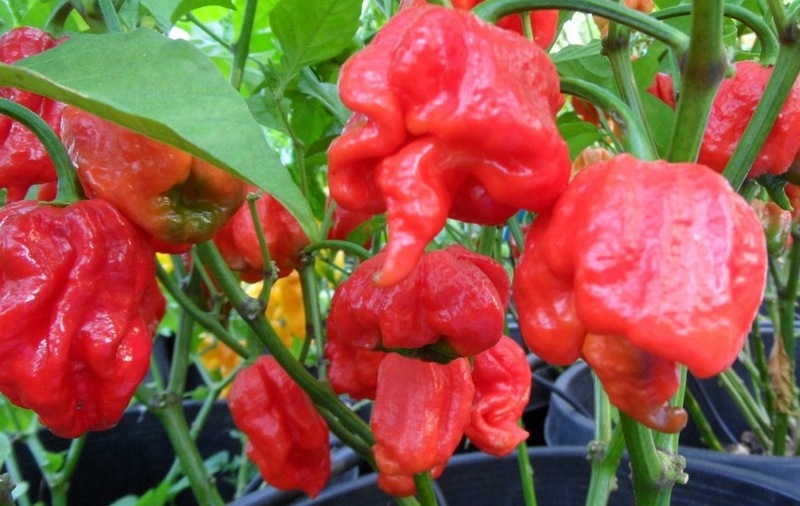 I left out Moruga Scorpion because they mostly all look the same, way mean more stability in that strain. 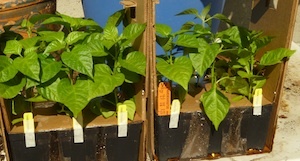 From left to right Trinidad Scorpion, Douglah 7 Pot, Trinidad 7 Pot SR strain, and Yellow 7 Pot. Now my last-to-last photo will show three types. 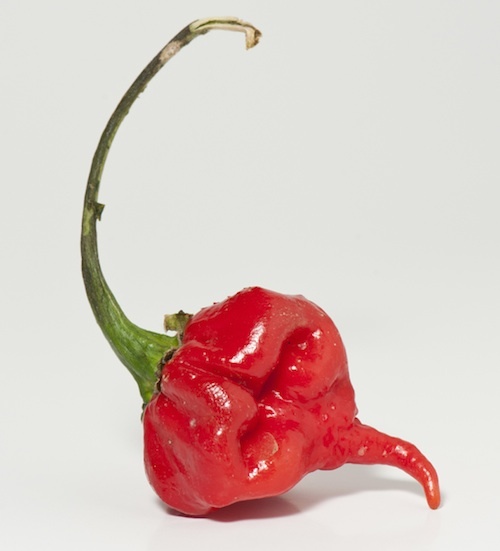 All three types resemble the Moruga Scorpion. 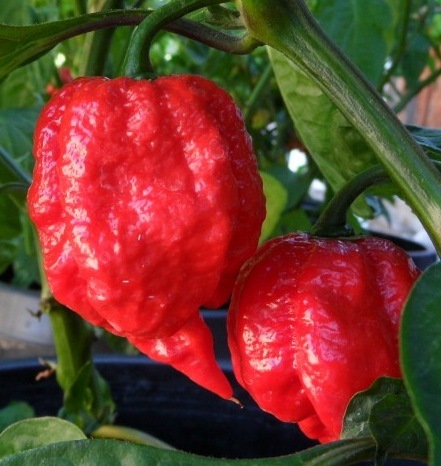 And again I say the Moruga looks like a larger version of the SR strain 7 Pot. From left to right two pods of each Yellow 7 Pot, SR strain 7 Pot and Moruga Scorpion. 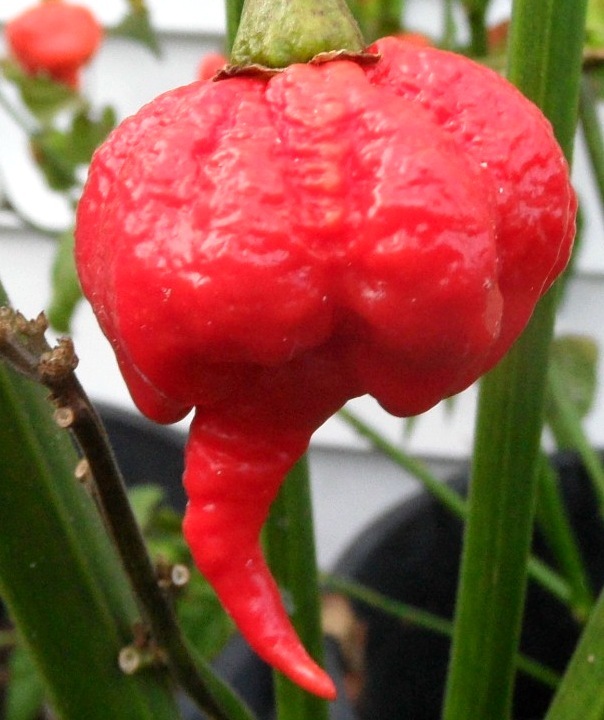 On a final note, there are many other peppers that crossed with all of 7 Pots or Scorpions throughout history. 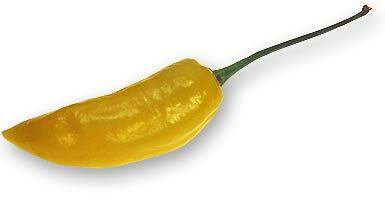 The Congo Red, Congo Yellow, and Congo Black (chocolate habanero) are definitely in the bloodlines of these peppers. 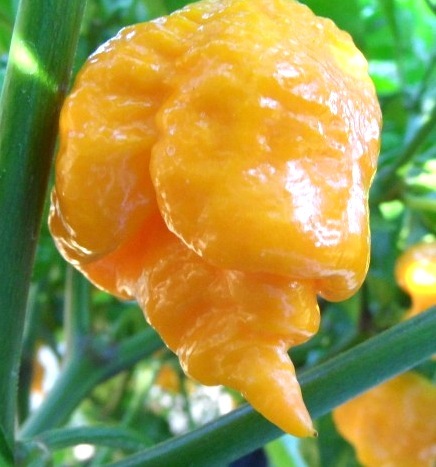 And if you notice the bonnet or hat like shape in both the Trinidad Scorpion and Trinidad 7 Pot you know the true Scotch Bonnet is a distant cousin as well. So after seeing all of this do you believe a 7 Pot is a Scorpion and a Scorpion is a 7 Pot? The great fun in chile growing is we can perfect these different variations. I think God had fun giving us so many varieties! Now we can isolate and selectively grow to get the features we want! And by all means make up some cool names to go along with them too. Have fun growing and eating! My final picture shows you I am having fun!